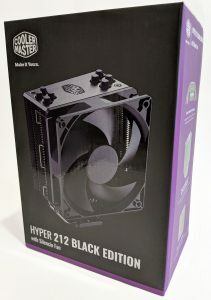 Cooler Master has recently released its latest revision to its legendary Hyper 212 lineup, the Hyper 212 Black Edition. 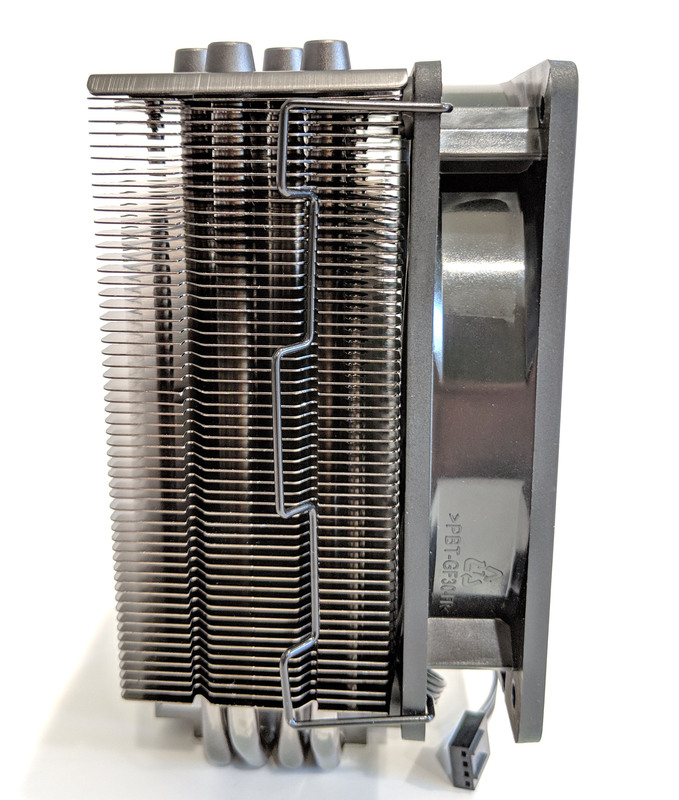 This new version lives true to the Hyper 212 name featuring the same quad heat-pipe tower design and direct-contact heat-pipes. The main difference is the blacked out color scheme, hence the title: Black Edition. 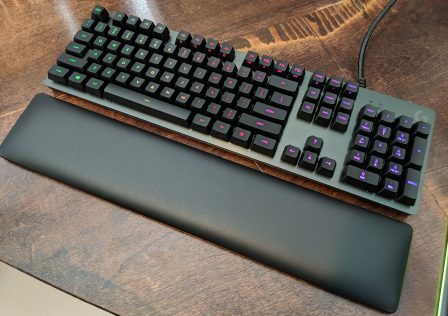 There has been a healthy demand for dark or blacked out components for stealthy system builds lately. 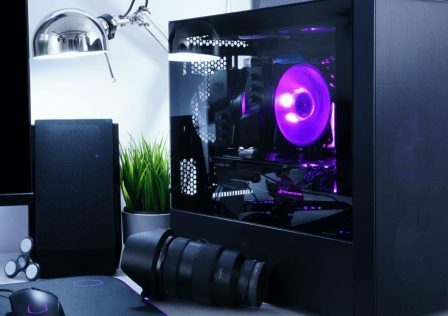 These particular coolers are targeted towards those types of gamers or system builders who prefer those dark subtle looks. 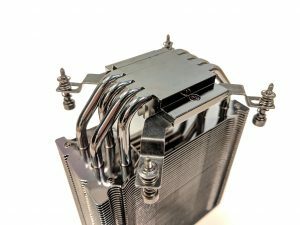 The Hyper 212 lineup has roots going back to the original cooler’s release in 2009 (which did an awesome job cooling my Q6600 back in the day). 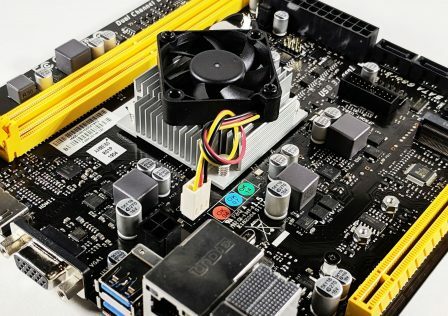 The amazing performance you’d get in an inexpensive package is what has kept system builders coming back build after build. Two different versions of the Hyper 212 Black Edition have been released, one with a stealthy Silencio Fan, and another with an RGB enabled fan (SF120R RGB). 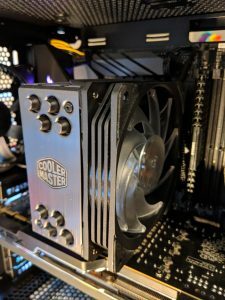 In this review, we’ll take an in-depth look into both coolers and compare each of their features, and even drill down into some performance numbers to see if there is any difference between the two fan types. The new revision of the Hyper 212 Black Edition keeps tradition alive using the same basic model that you would find on the original Hyper 212 CPU cooler. It features quad heat pipes which make direct contact with the CPU rather than having to go through a base plate. This decreases heat transfer time and material which, in turn, makes for lower CPU temperatures overall. 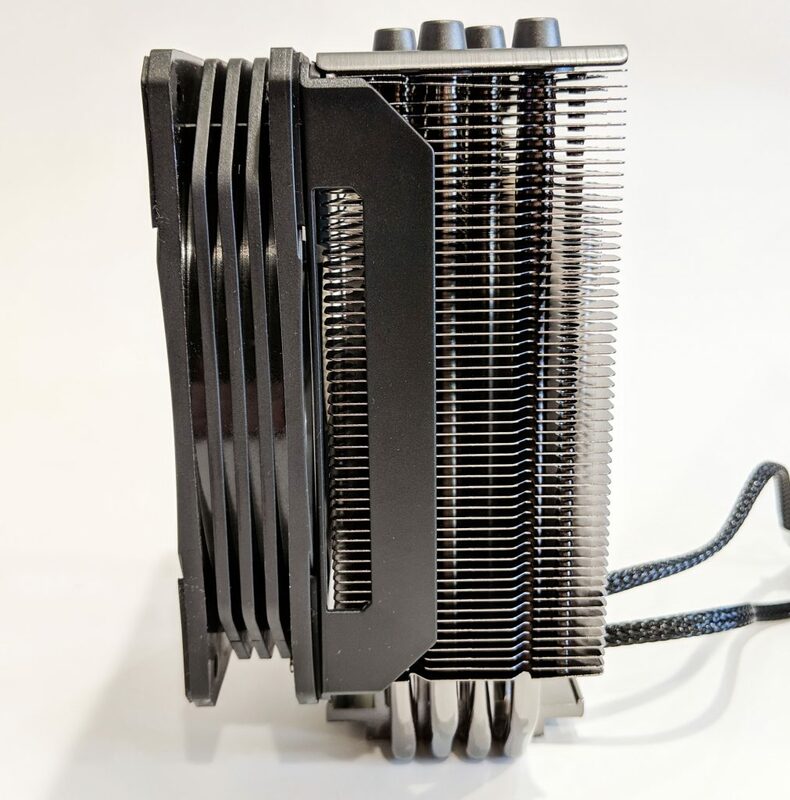 The CPU cooler also provides the same stacked aluminum fin design that we’ve seen in the past. 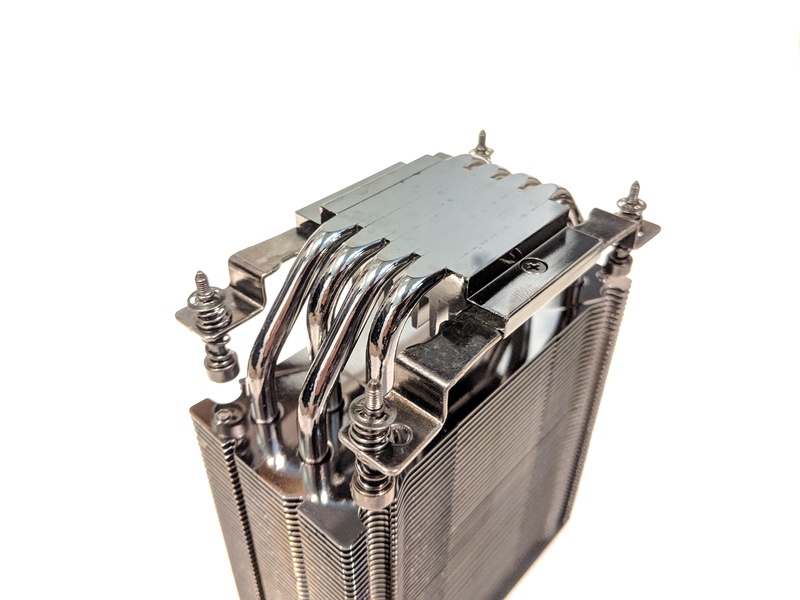 Both the fins and the heat pipes are coated in a dark nickel coating giving the cooler its stealthy look. The very top of the cooler got a face lift which features a brushed aluminum surface finish for a more premium look and feel. 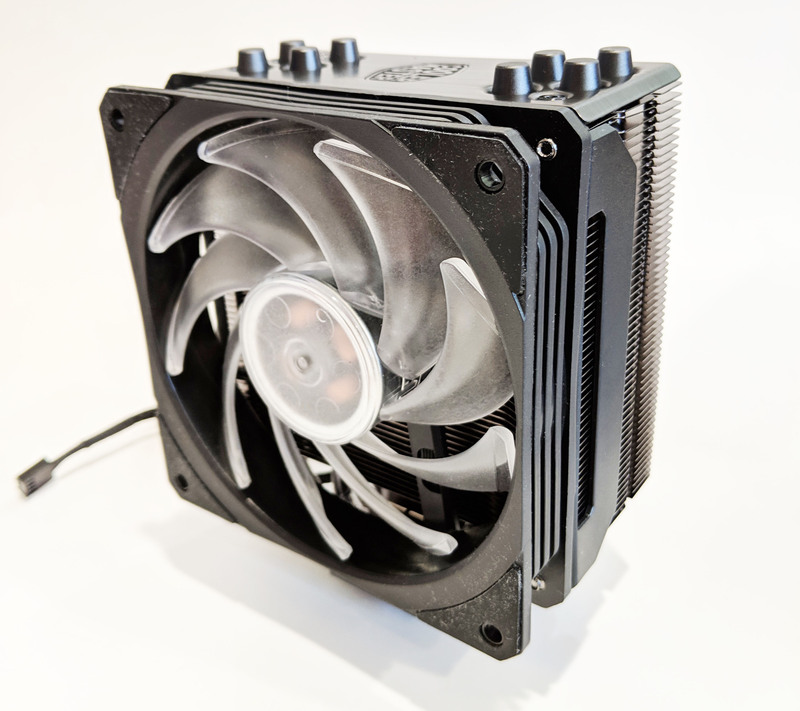 The included Silencio fan is designed for silent operation even at higher speeds. It’s attached to the heatsink by two metal retaining clips on either side. 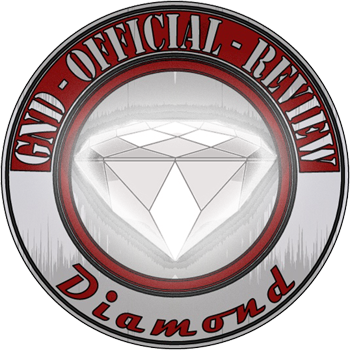 We’ll go into its installation and removal process later on in the review. 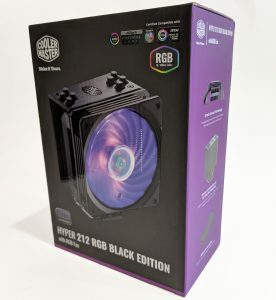 The only difference between the the Hyper 212 RGB Black Edition and the non-RGB version is the included fan. 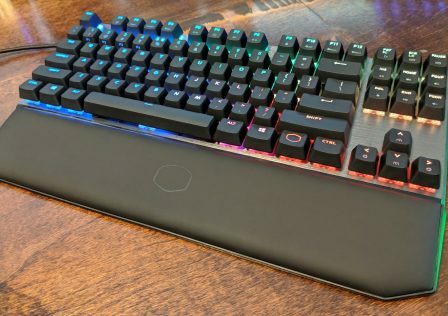 The RGB Black Edition features all of the features listed above such as quad direct-contact heat pipes, nickel coating, and a premium aluminum finish on the top panel. 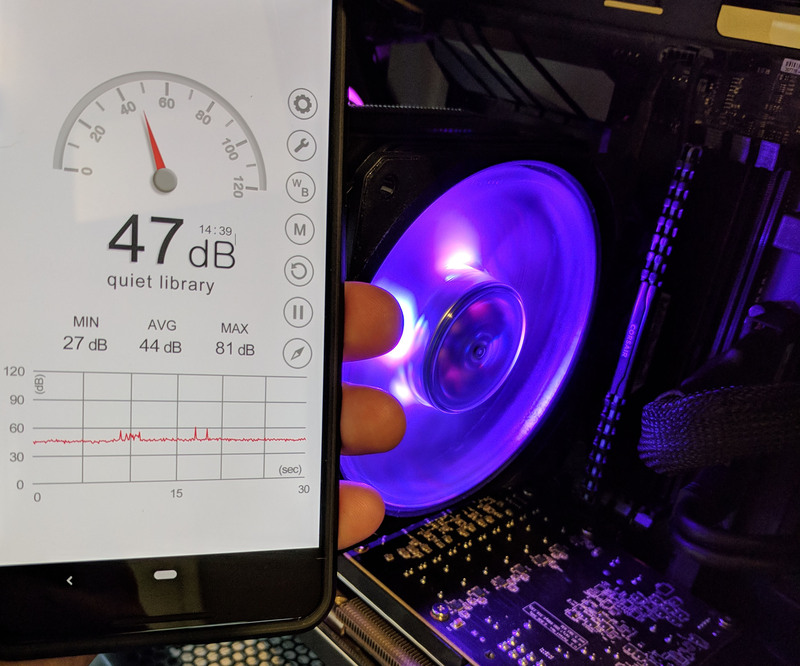 Besides the obvious visual difference between the two fans, it’s important to note the difference in CFM and power consumption between the Silencio and RGB fan. The Silencio fan draws only 0.96W and can provide up to 42 CFM. 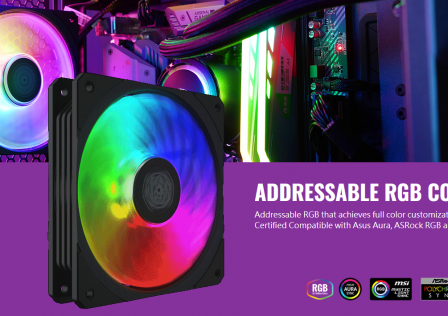 The RGB fan draws 1.92W and provides up to 57.3 CFM. 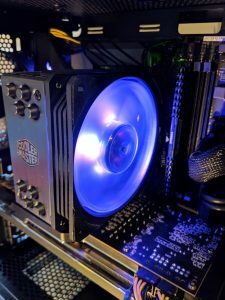 While power consumption is doubled in the RGB fan, it’s likely due to the power required to run the LEDs, rather than the fan itself drawing that much power. Now, let’s take a look at each one of the coolers in detail! We’ll first take a look at the packaging so follow along as we let the unboxing commence! 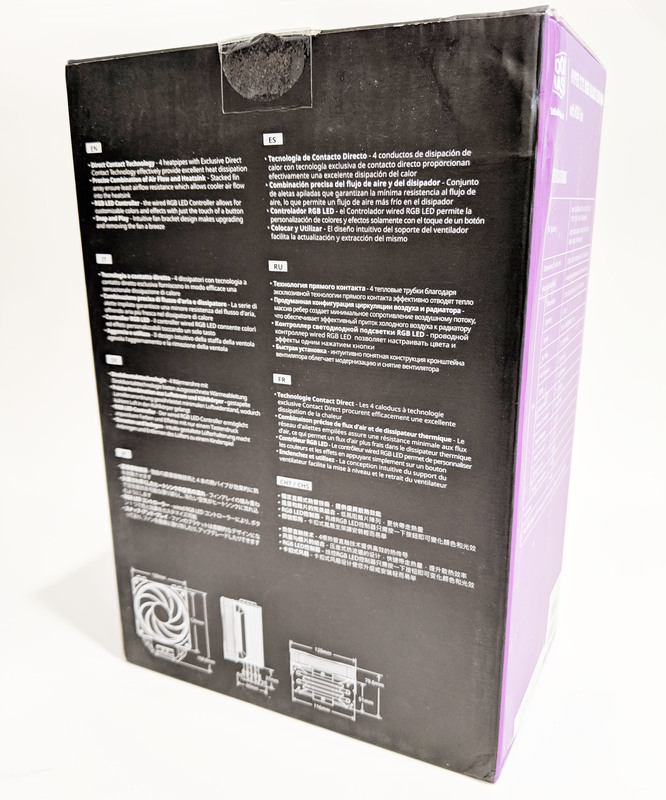 The Cooler Master Hyper 212 Black Edition CPU cooler with the Silencio fan comes packaged in a cardboard box featuring Cooler Master’s traditional color scheme of black and purple. 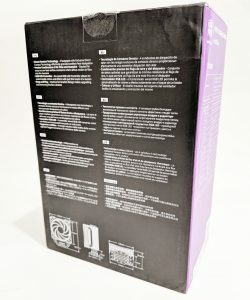 The front of the box is simple and presents a large, clear photo of the cooler so there is no question as to what you’re buying. The back of the box has a few diagrams, very useful for verifying fitment before installation. Also found are a few feature highlights in eight different languages. 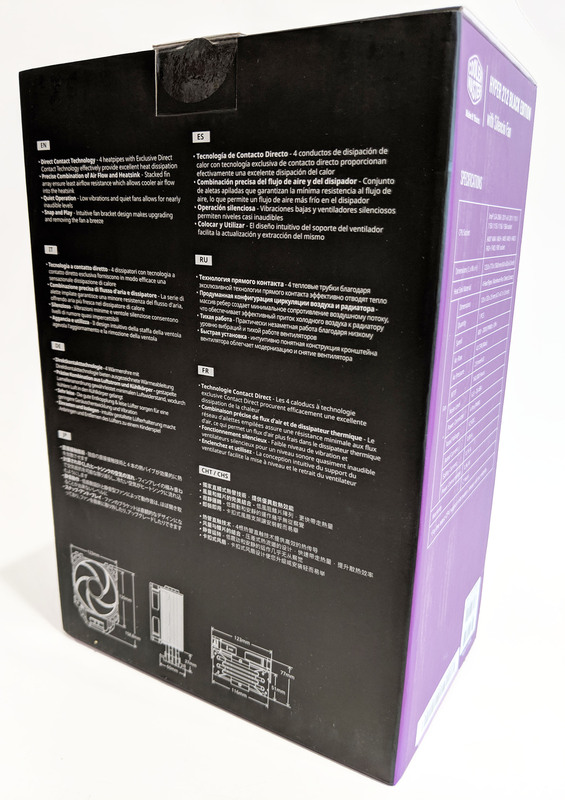 Similarly, the Cooler Master Hyper 212 RGB Black Edition CPU cooler’s box features the same design and overall scheme. 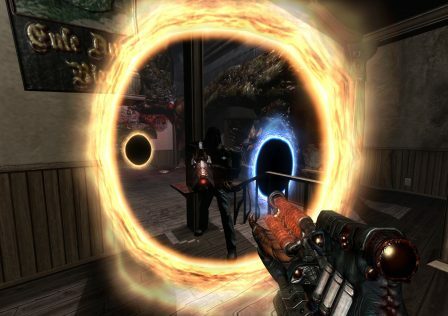 The front focuses on the RGB lighting in the top right corner. Various compatible motherboard control software is also presented. Upon opening the box, packaging for the two coolers was identical as well. This first thing you’ll notice is a white accessories box. This is important because it contains all the screws and mounting hardware you’ll need for installation. Both coolers were snugly secured in a custom formed soft plastic shell. It does an excellent job keeping the cooler from sliding around during shipping. Considering the fact that both coolers were shipped and arrived in perfect shape, I believe the packaging to be more than adequate. Now that we’ve got the cooler out of the case, let’s take an in-dept look at some of its features. The first thing you’ll notice is the overall color scheme. The entire cooler is dark, consisting of mostly gray and black. The dark nickel coating looks really sleek and gives it a kind of shiny-dark chrome look. 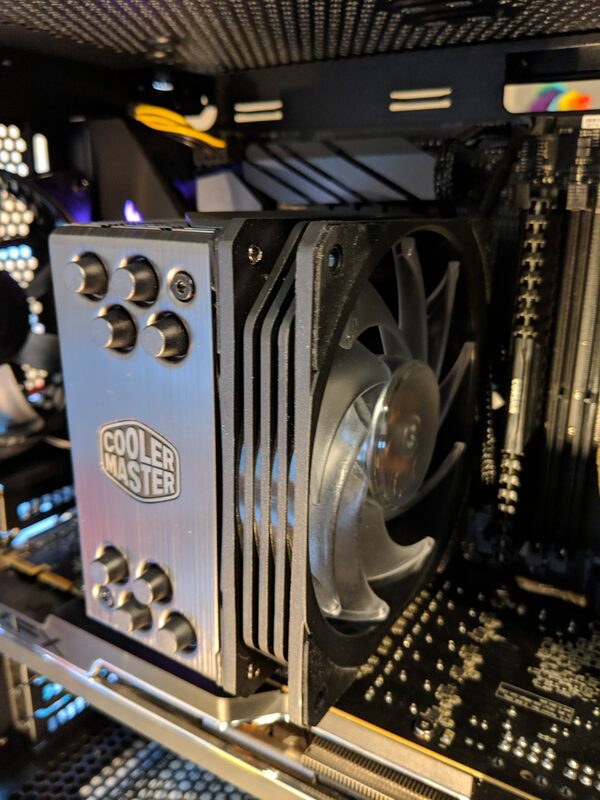 The brushed aluminum panel added to the top of the cooler adds a few points to the overall quality look and feel of the cooler, something the previous generations of Hyper 212 coolers lacked. 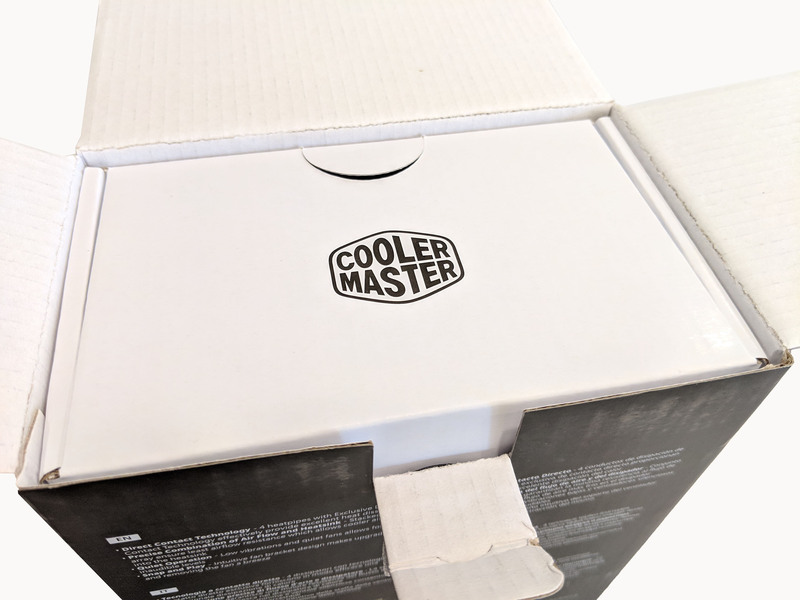 The size and shape of the cooler should feel very familiar if you’ve used one of Cooler Master’s Hyper 212 coolers in the past. The Silencio fan honestly doesn’t look like anything too special. The fan consists of five fan blades angled very aggressively. 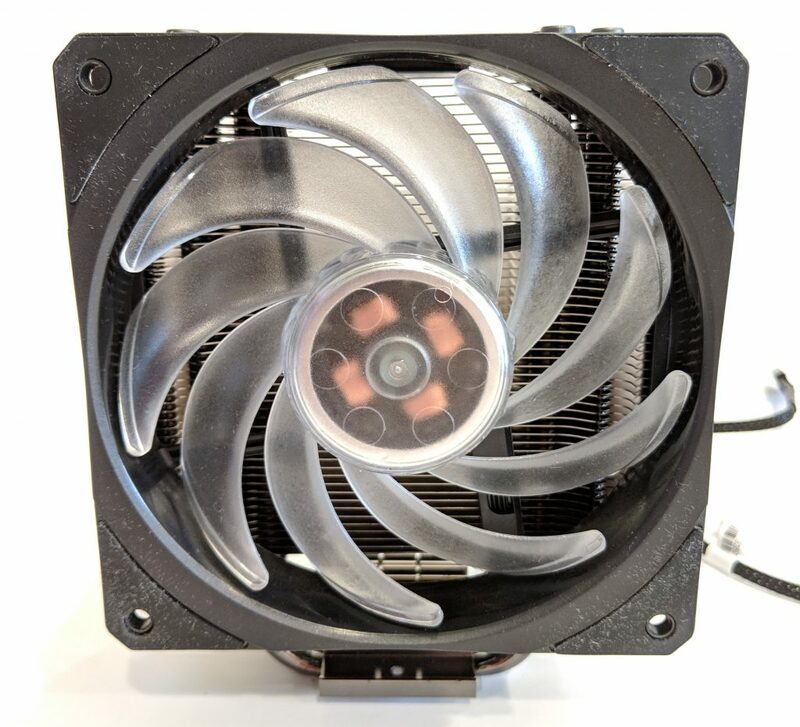 The primary purpose of the fan is to drive air through the heatsink and to do so quietly. 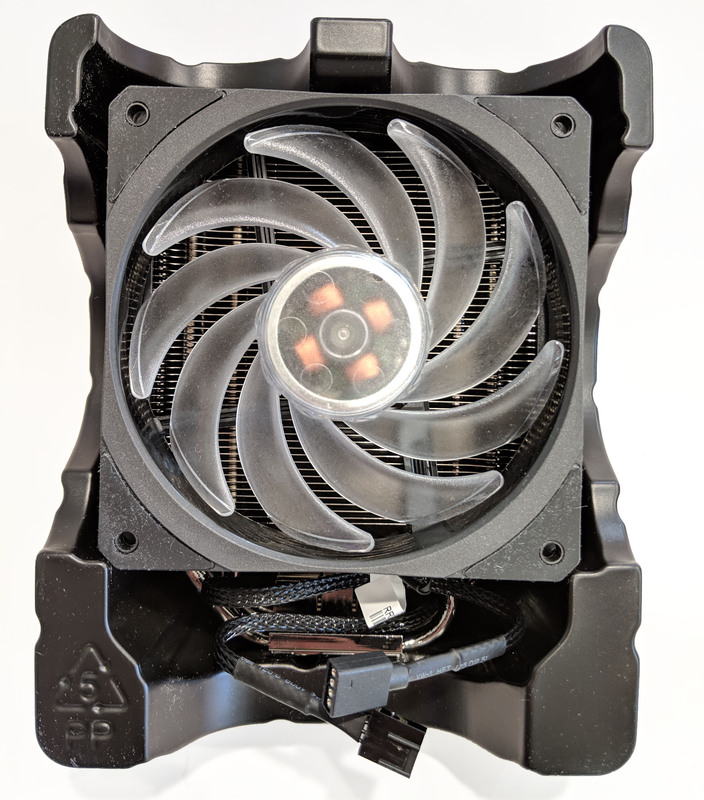 From a looks perspective, the fan looks like it would do a good job moving a large amount of air, so we’ll see how it does during our tests later on in the review. 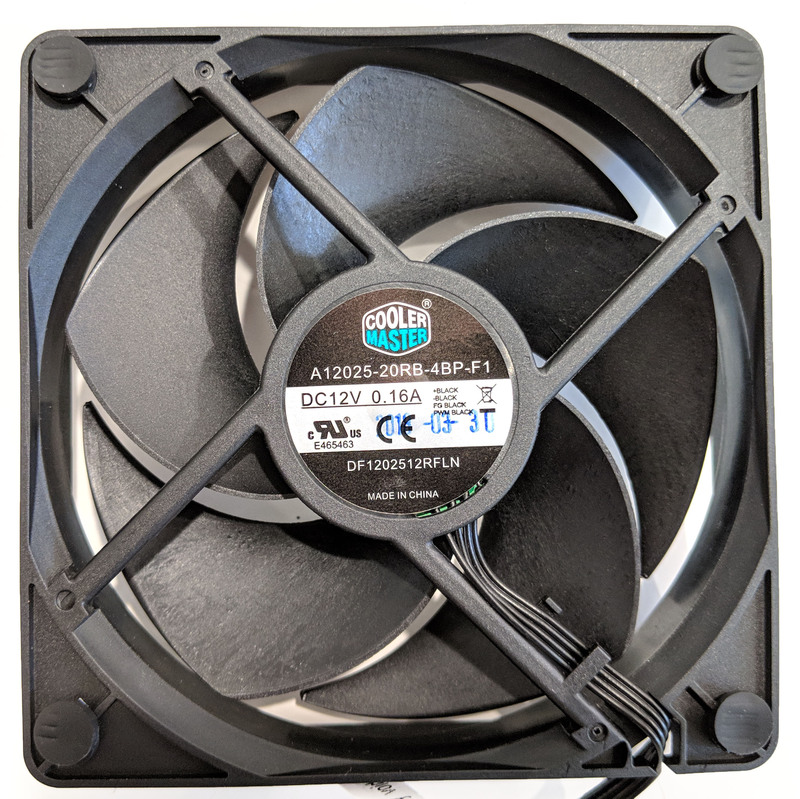 The reverse side of the fan reveals a few more details such as the part number (A12025-20RB-4BP-F1) as well as it’s voltage and current ratings. 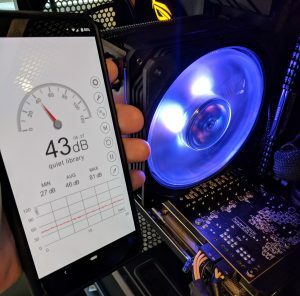 With a current rating of 0.16, I can’t imagine this thing getting very loud or spooling up very fast, so we’ll see how well it does keeping everything cool. Another thing to note are the four rubber pads on each corner. These isolate the fan from the heatsink to help reduce vibrations. On the reverse side we get a better look at the fins (55 of them in case you were wondering). On each side you get a clear picture as to how the fan mount bracket works. 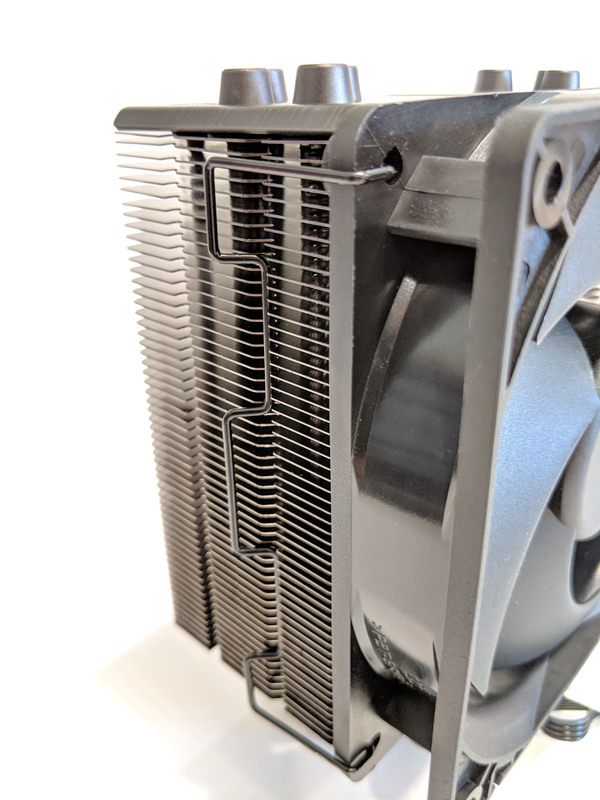 The clip fits into the existing screw holes on the fan and wraps around to the cooler. The fins on the cooler have grooves for the wire bracket to slide into. Pretty simple install overall. 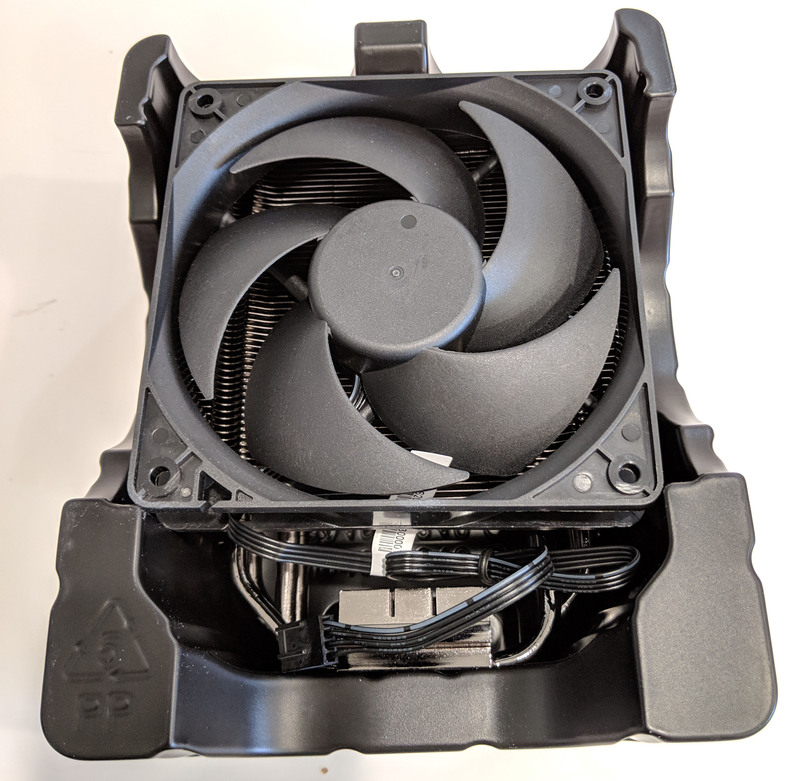 Cooler Master also included two additional clips for mounting another fan on the opposite side for a push-pull airflow configuration. On the bottom of the cooler we get a better look at the direct-contact heat pipes. 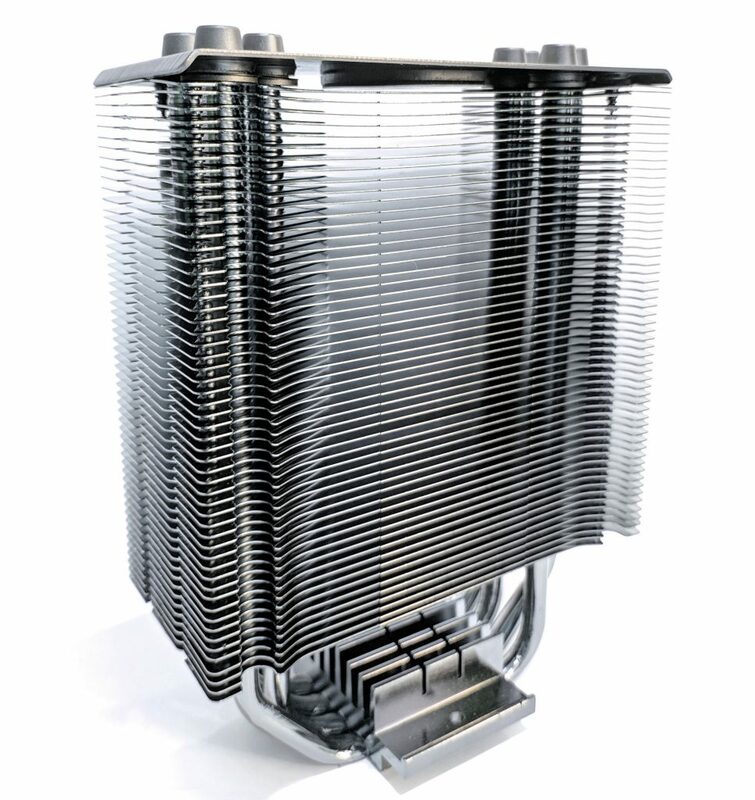 The contact patch is much larger than previous generations of Hyper 212 heatsinks. Be sure to remove the plastic protector before installation! 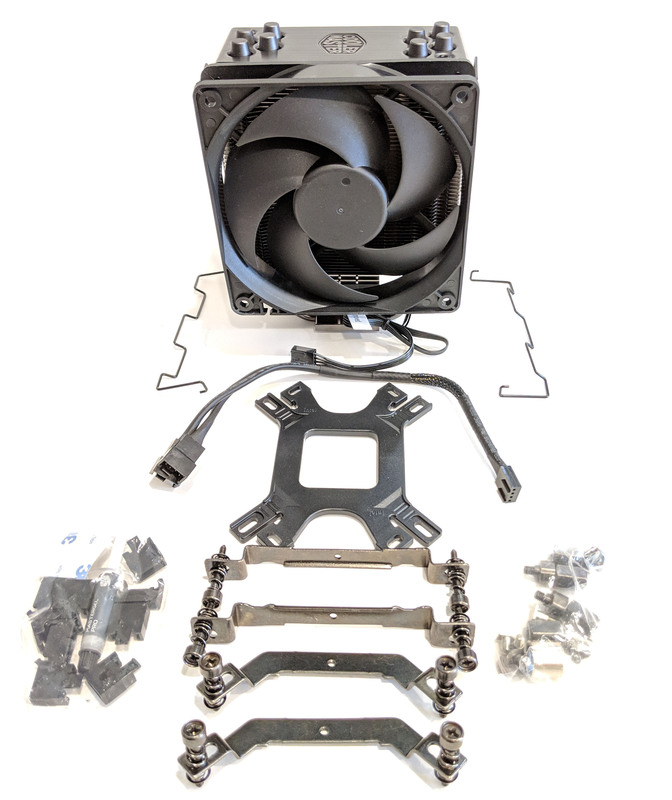 Included with the cooler is all the mounting hardware you will need. 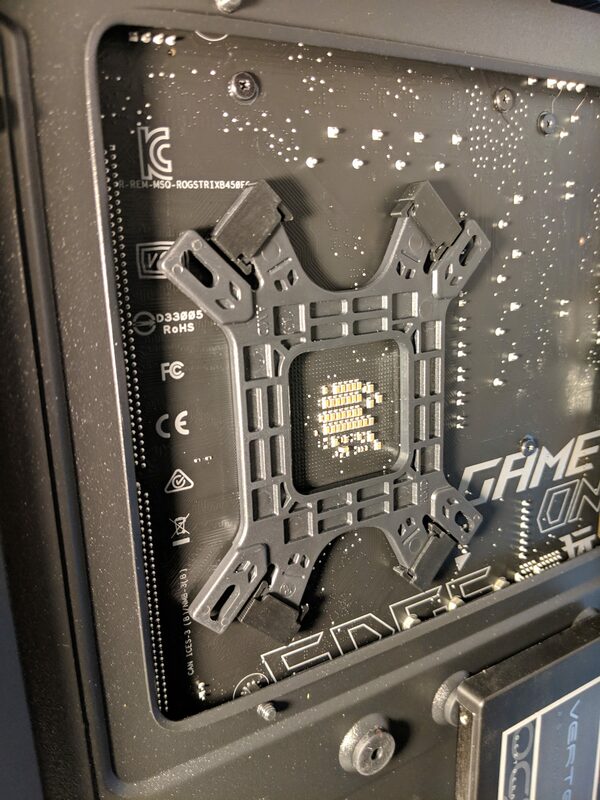 The main square back plate sits behind the CPU and provides through-hole screws to the front of the motherboard for securely mounting the heatsink. Also included is a 4-pin PWM fan splitter. 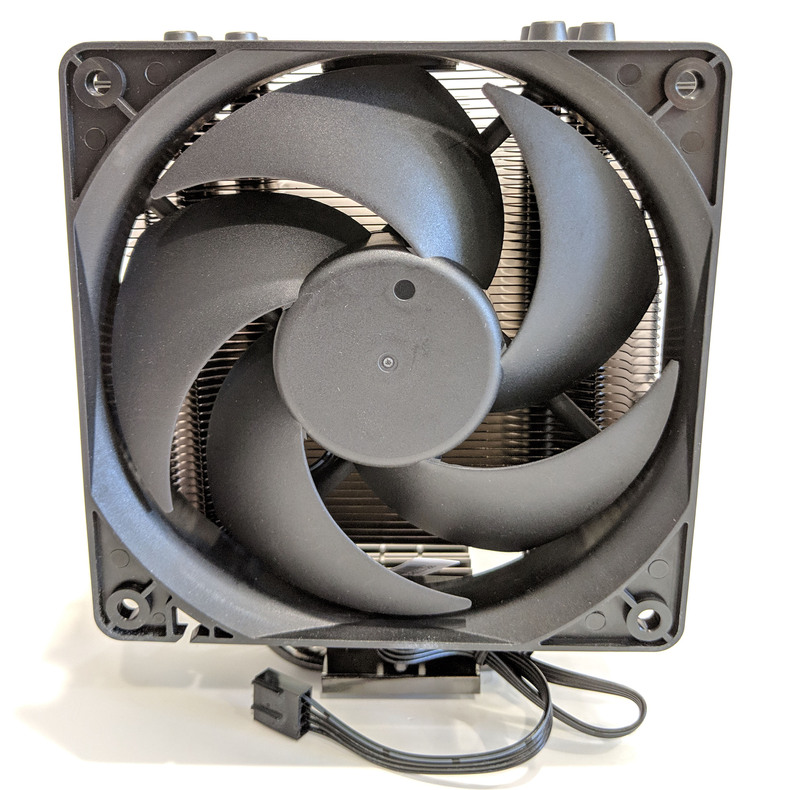 This is used to provide power to the main heatsink fan, as well as an additional fan if you so chose to use one provided your motherboard has no additional fan connectors. Also included are four additional rubber fan mounts and thermal paste. 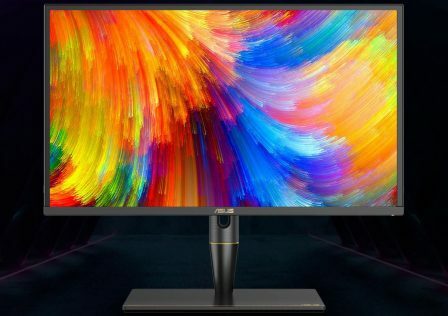 As I mentioned before, there are no differences between the RGB version of the Hyper 212 Black edition and the standard. The fan, the RGB controller, and the fan mounts are the only differences. With the RGB fan installed, the cooler does loose a little bit of that super stealthy vibe we were getting from the previous one. 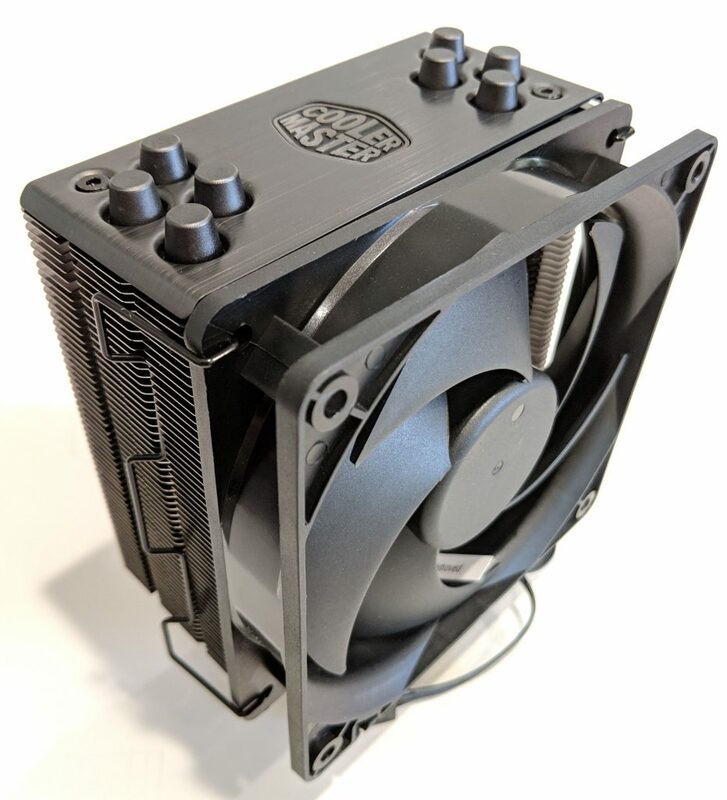 The RGB Black Edition cooler combines a bit of stealthy and some RGB flashiness which would look great in a windowed case. The fan consists of a black plastic shroud and clear plastic fins. The clear plastic glows when the LEDs in the center motor area turn on. It’s rated at a bit higher speed than the Silencio fan we talked about earlier so in theory it should move a bit more air. On the reverse side of the fan we get a few more details about the fan (DF1202512RFMN). Current draw is rated at 0.37A, more than twice that of the Silencio fan found on the Standard Black Edition. Speed rating is 6500-2000 RPMs. Rubber fan mounts on each of the four corners keep the fan secured in place once installed, and should help in reducing vibrations. 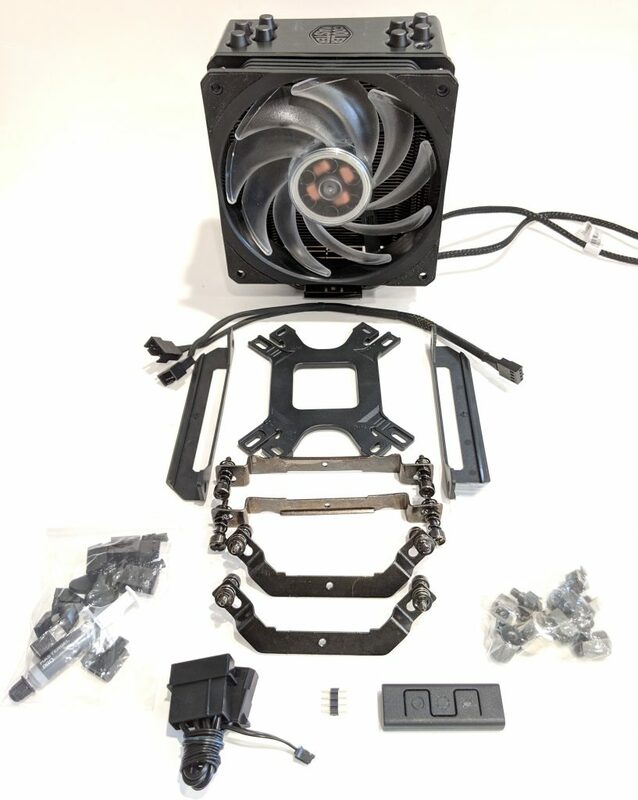 The fan mounts used to attach the fan to the heatsink are another difference between the two coolers. 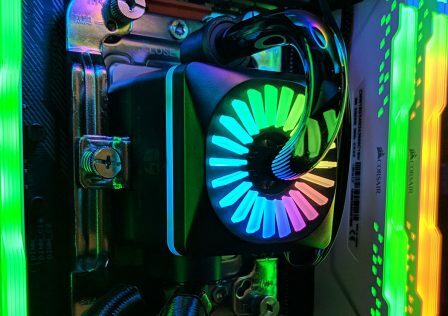 The Hyper 212 RGB Black Edition uses plastic mounts that are screwed into the fan. The plastic mounts clip into the grooves found into the heatsink. 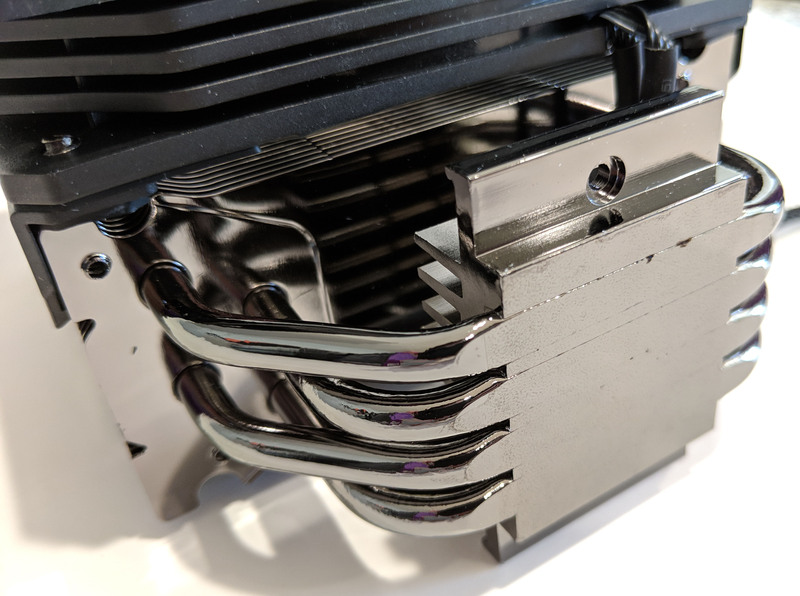 This particular method I found is a bit easier to use than the metal clips found on the non-RGB version of the cooler. 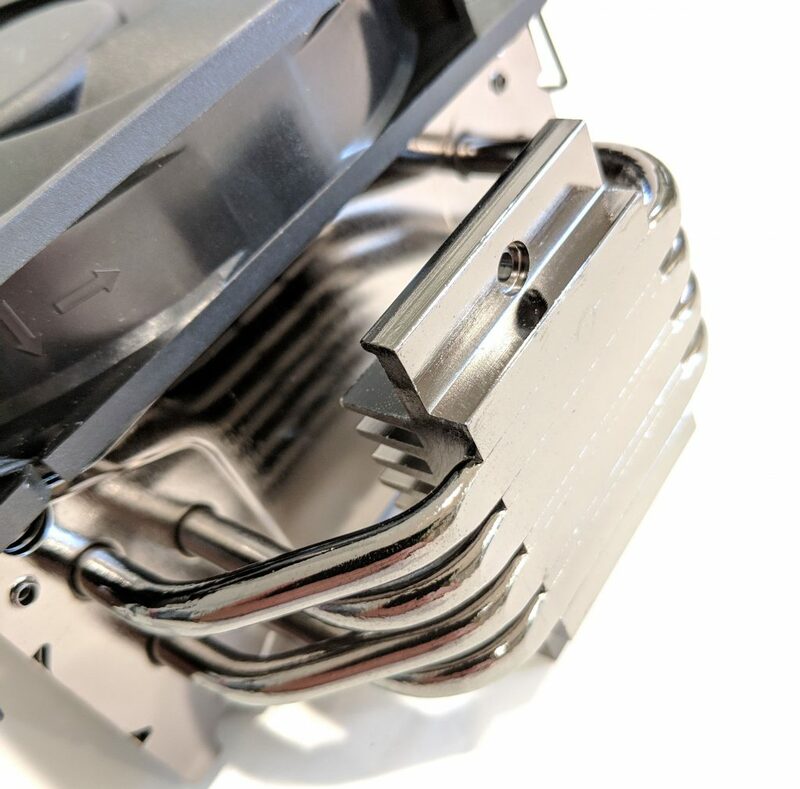 Identically to the previous version, the RGB edition of the Hyper 212 features direct-contact heatpipes. 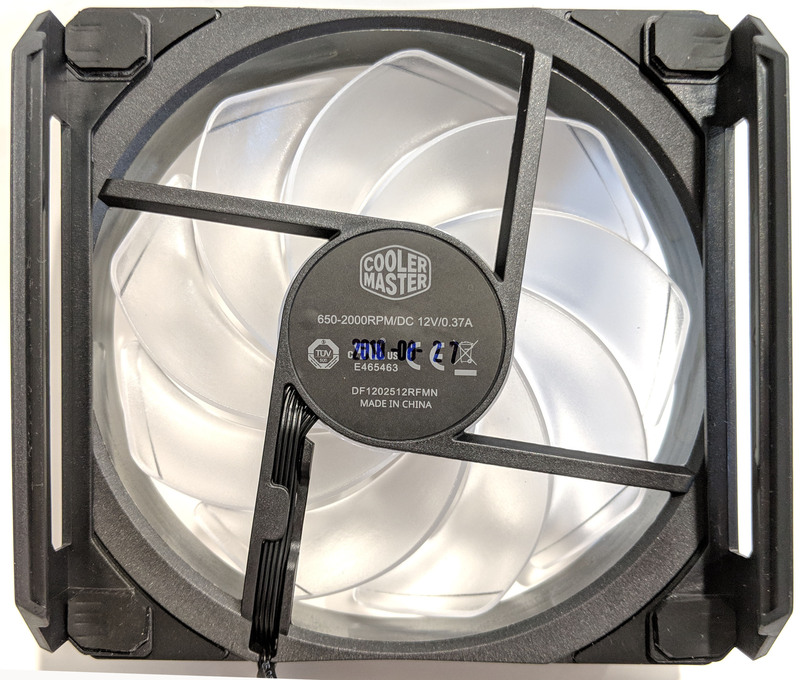 The Cooler Master Hyper 212 RGB Black Edition features two connectors for the fan: a 4-pin PWM fan connector and an additional 4-pin RGB LED connector. 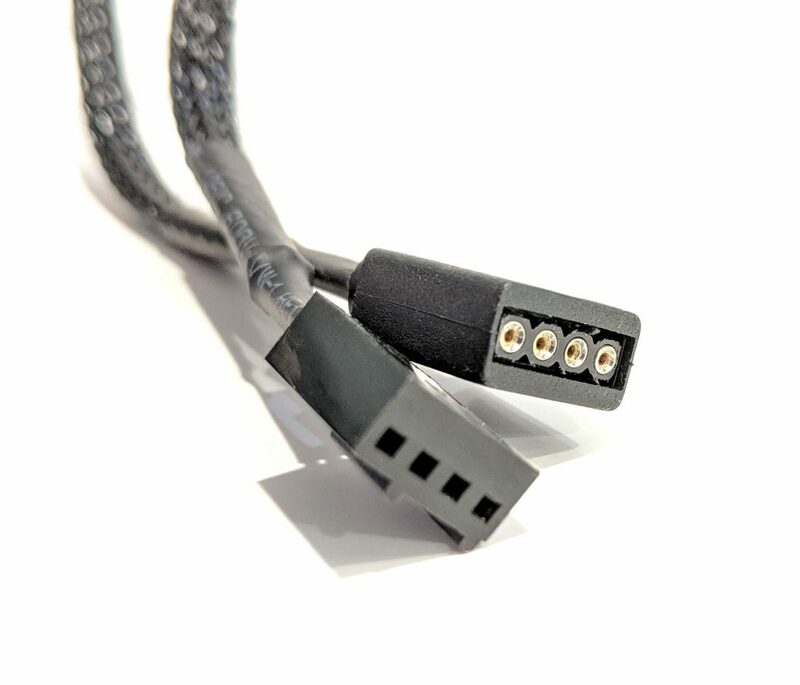 This particular RGB connector is meant for use with either the provided LED control module, or a 12V analog RGB connector on the motherboard. 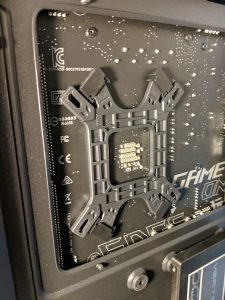 In our case, our ASUS ROG Strix B450 motherboard we used for testing had a 4-pin connector. This let us use ASUS’s AURA Sync software to match the LED colors and effects of the fan to that of the motherboard. 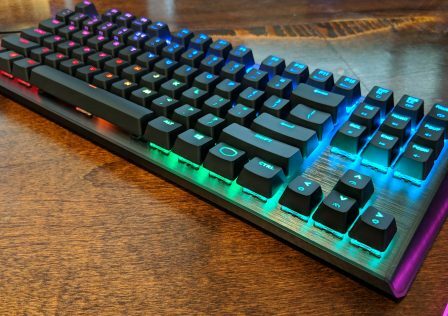 The RGB Black Edition includes everything found in the non-RGB version with the addition of the RGB LED controller. 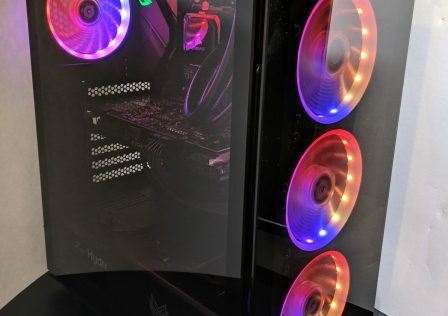 The controller is powered by a standard 4-pin MOLEX connector and provides power and RGB functions to the fan’s LEDs. 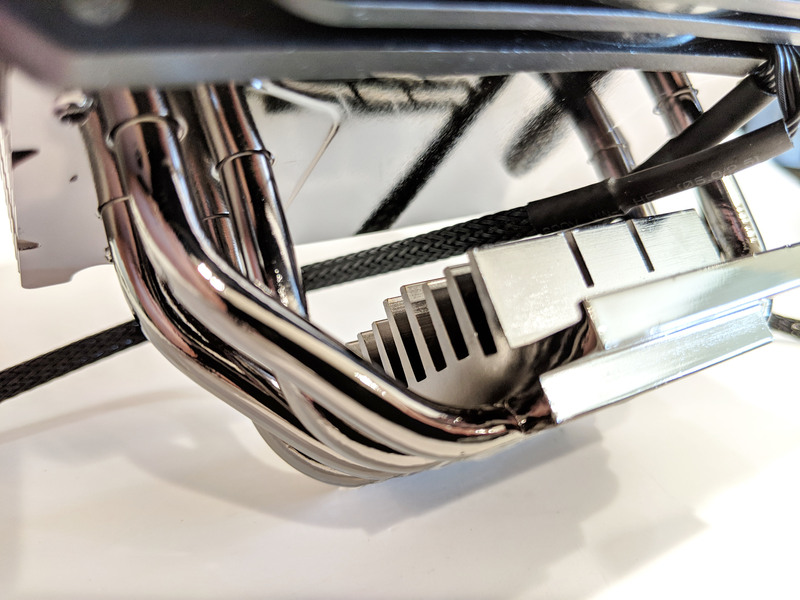 Installation for the Cooler Master Hyper 212 Black edition is pretty straight forward. 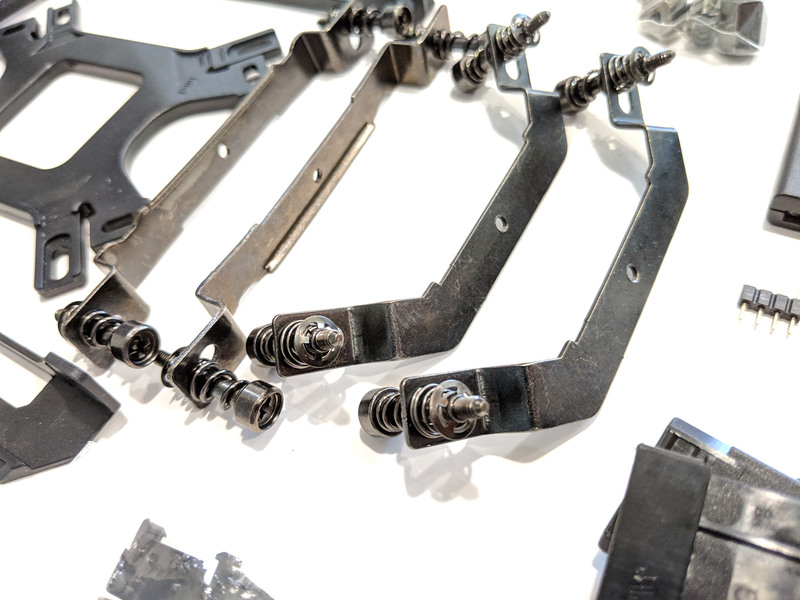 Start by installing the provided brackets for either Intel (Left) or AMD (Right). Assemble the back plate by placing the through-hole screws into the notches on the edge and then locking them into place with the plastic end pieces. Once assembled, place it on the reverse side of the motherboard, lining up the holes and screwing it down from the front (CPU Side). Next, remove the fan from the heatsink assembly. 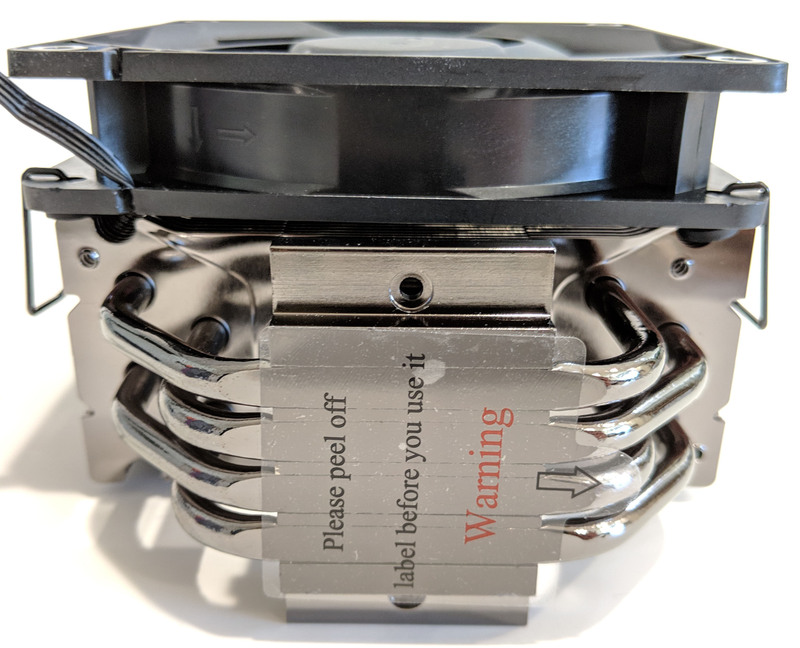 This is important as the fan blocks access to the screws used to tighten down the heatsink to the back plate assembly. 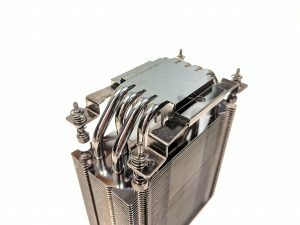 Apply thermal paste (a little goes a long way), and torque down the heatsink to the backplate, each screw a little at a time. A long Philips screw driver helps here. Next install the fan, and plug it into the CPU_Fan header on the motherboard. 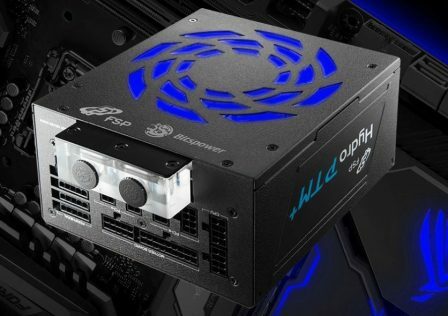 For the RGB edition, connect the 4-pin RGB plug either into a supporting motherboard, or LED controller.Power on the system and enjoy! For testing we will first compare noise levels between the two coolers at idle and at maximum fan speeds. CPU temperatures will also be compared. 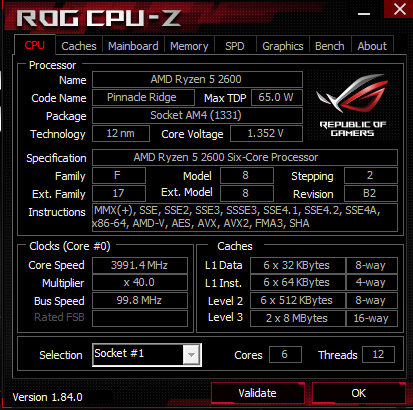 We’ll also test the performance of the two coolers both on stock CPU speeds as well as overclocked. Cooler Master Hyper 212 Black Edition – For testing I used a decibel meter via an Android App. 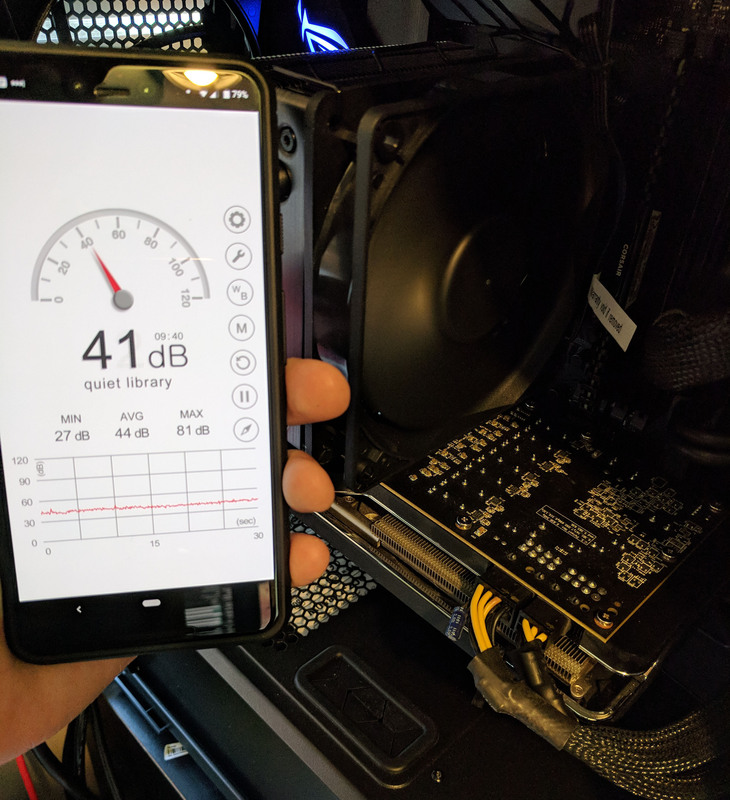 Not the most accurate, but it will provide us valuable data such as audio differences between sound levels at minimum and maximum fan speeds. All other system fans were disabled so we can accurately measure just the CPU heatsink fan. Overall sound levels were very low. 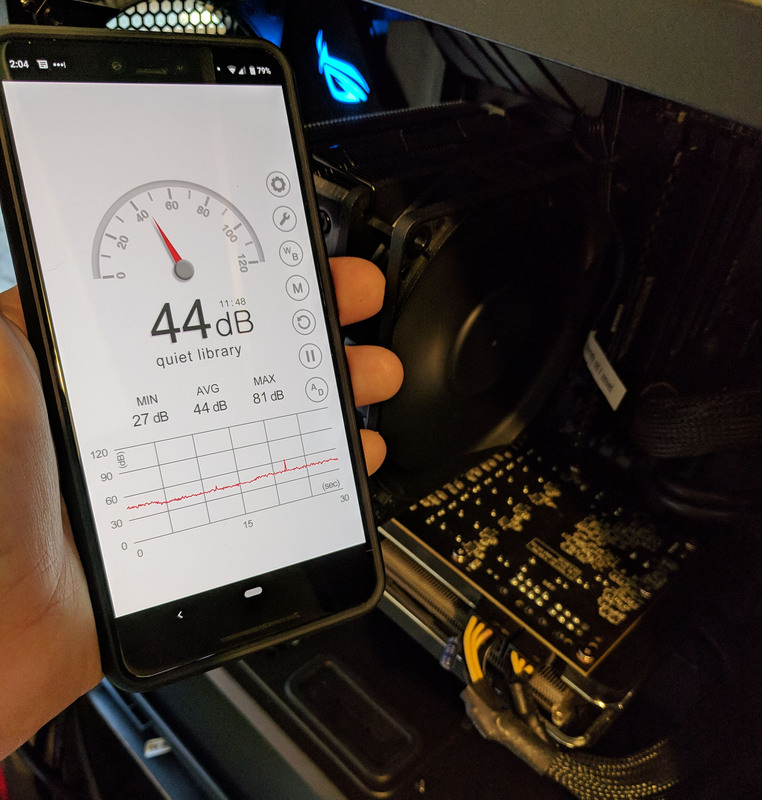 At idle, I recorded 41dB, and at 100% fan speed, an increase of only 3dB was recorded. 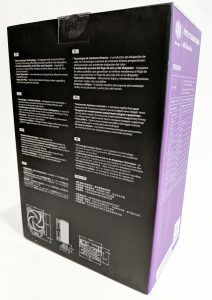 Cooler Master Hyper 212 RGB Black Edition – There was a slight increase in noise when using the RGB fan. At idle 43dB was recorded and at 100% fan speed 47dB was recorded. Still quite quiet and in a closed system, even at maximum speeds, it’s likely you’ll never hear it. 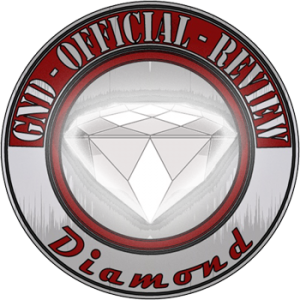 Overall, really good sound levels. Even at maximum levels, the fan was almost silent, and could not be heard at all with the case side panel closed. For this test we’ll take a look at how both coolers did cooling our Ryzen 5 2600 at stock speeds and with a pretty hefty overclock (4.0GHz). We’ll be comparing the coolers to each other (or the fans rather) as well as the stock AMD Wraith Spire cooler. 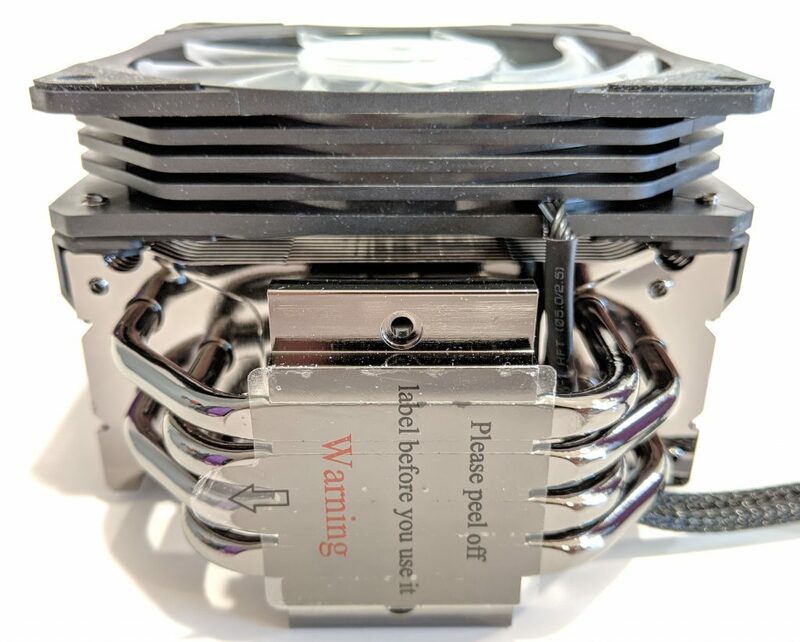 It’s very likely that anyone who purchases this particular CPU will be in the market for a CPU cooler upgrade especially if the user is looking to do any form of overclocking. 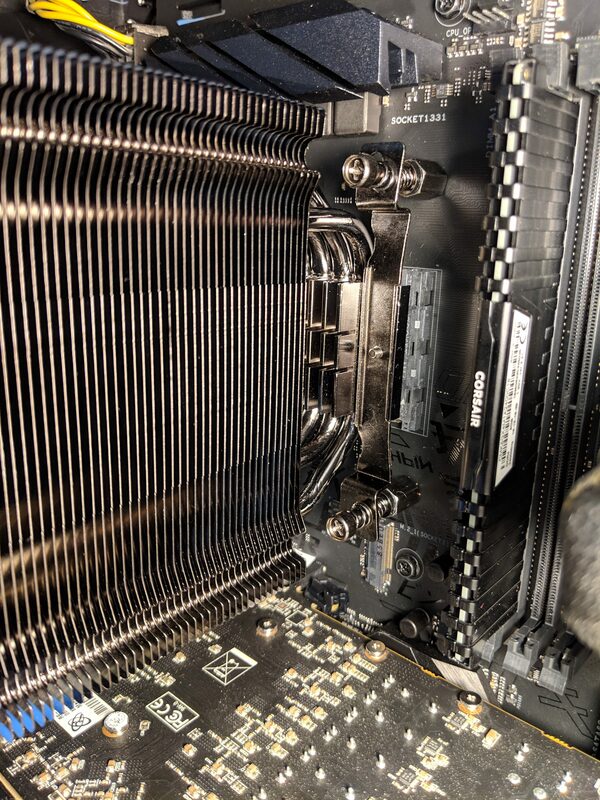 The Wraith Spire solid piece of aluminum and barely has enough Dakka to keep the Ryzen CPU cool at even stock speeds. 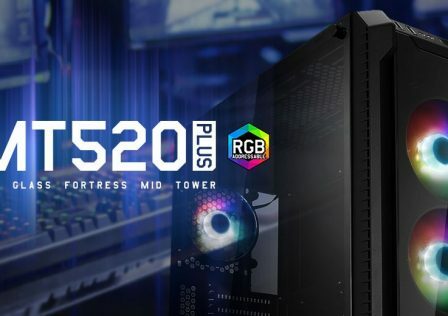 No surprise that the RGB edition produced slightly better results than the non-RGB version as it does come equipped with a slightly more powerful fan. 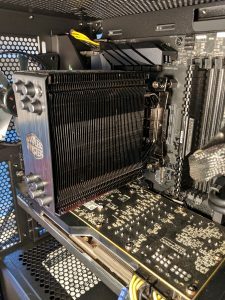 Regardless, we saw a massive decrease in temperatures between both Cooler Master coolers over the stock AMD Wraith Spire cooler, especially while overclocked. 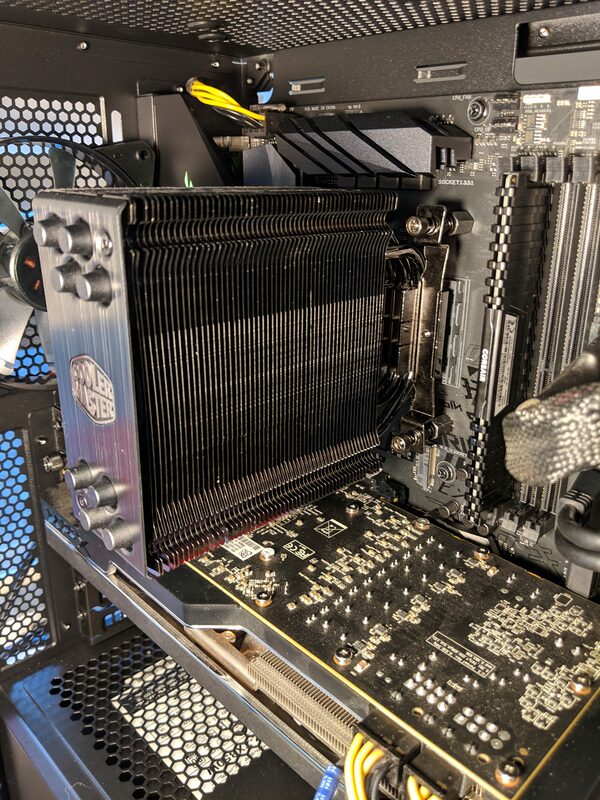 Overclocked temperatures at 100% load were down 19 degrees Celsius for the standard Black Edition cooler, and the RGB Black Edition dropped temps down 21 degrees. 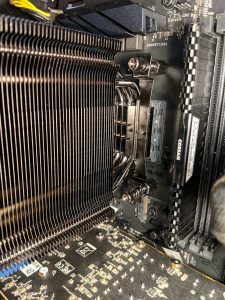 The difference is night and day, and if you plan on ever overclocking your AMD Ryzen AM4 CPU, either Hyper 212 Black Edition CPU coolers would be an excellent choice. 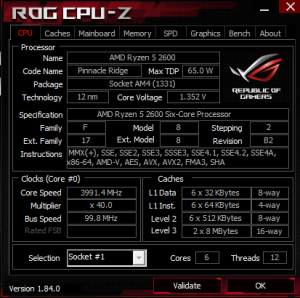 There’s a slight dip in temperatures between the two Hyper 212 coolers when overclocked. 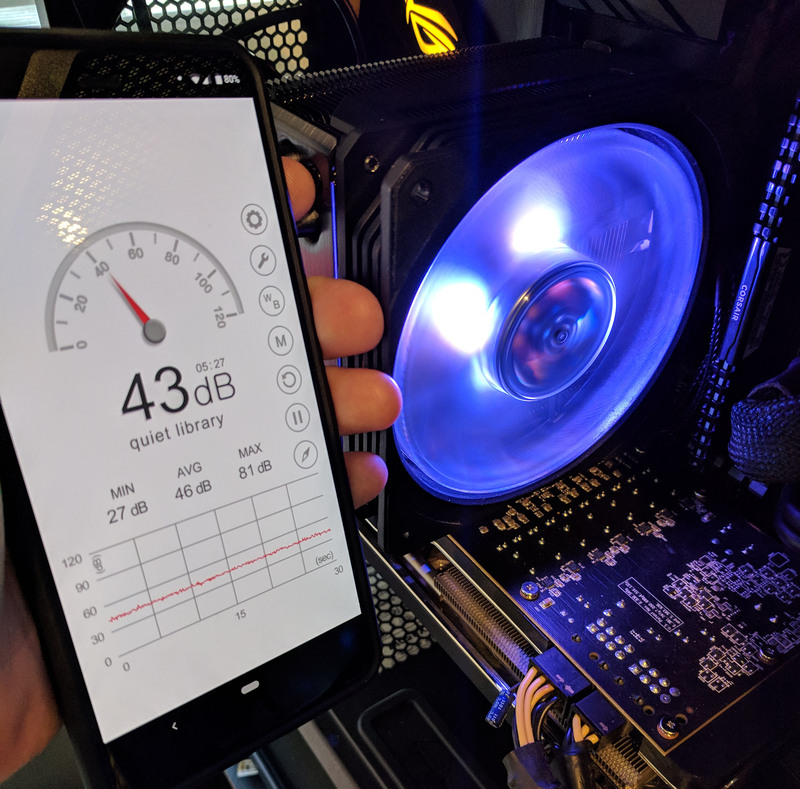 Non-overclocked temperatures were identical. 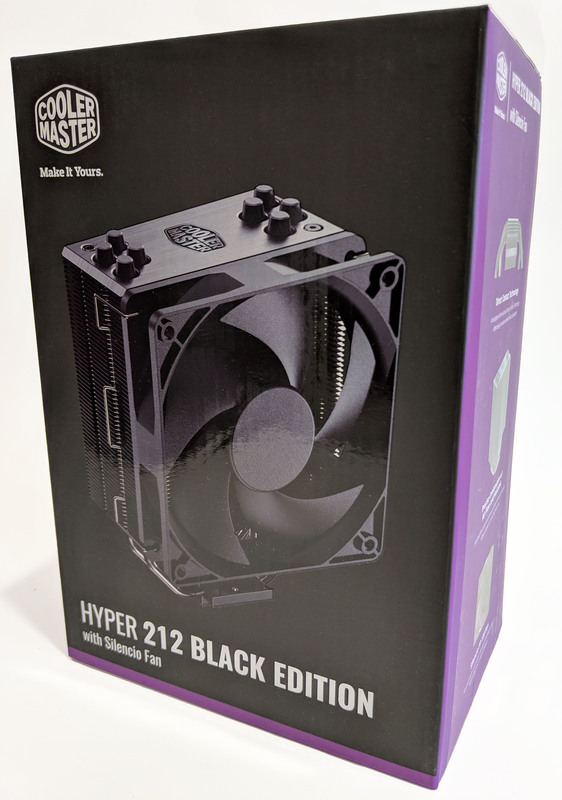 The Cooler Master Hyper 212 Black Edition is a welcomed and a modern redesign to the original Hyper 212 CPU cooler. 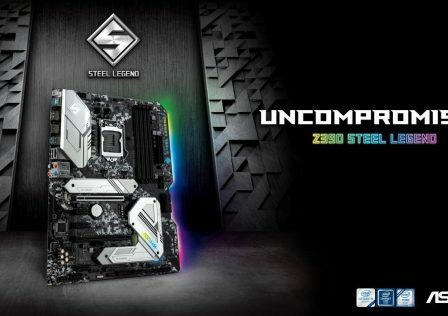 Not only does it provide your modern gaming rig with visually stunning features such as dark nickel plating and brushed aluminum panels, it performs just as well or better than the original cooler. 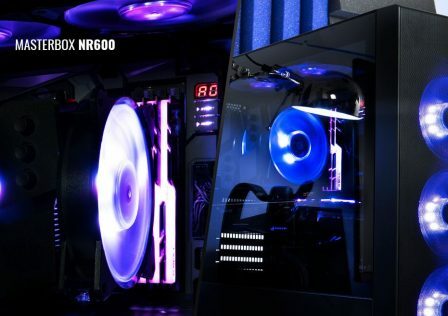 With an MSRP of just $34.99 for the Black Edition and $39.99 for the RGB version, there’s really no reason to go over individually scoring these CPU coolers. 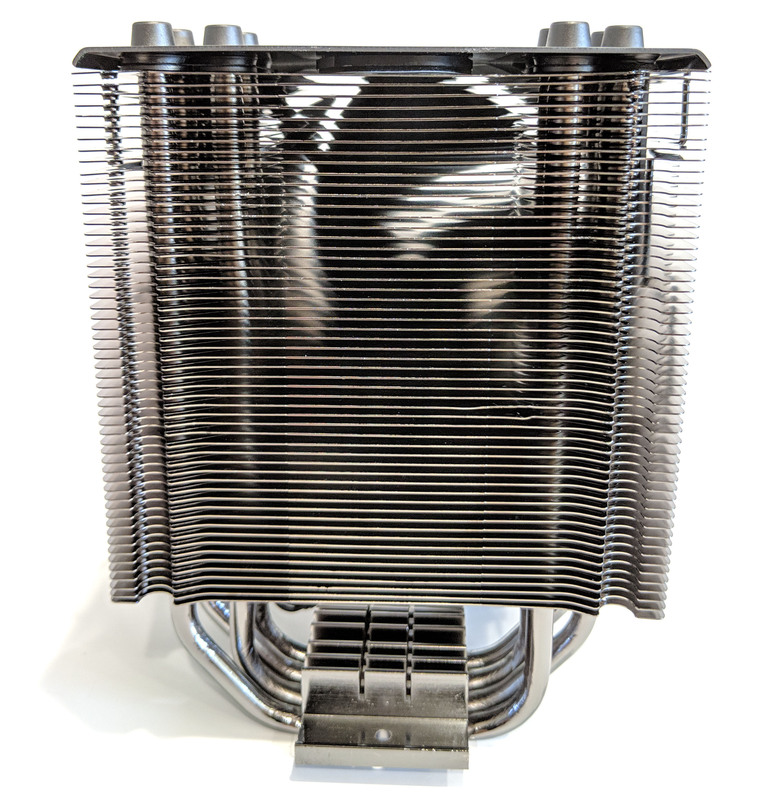 Its construction is solid, installation is a breeze and the results you gain especially over the stock cooler and massive. 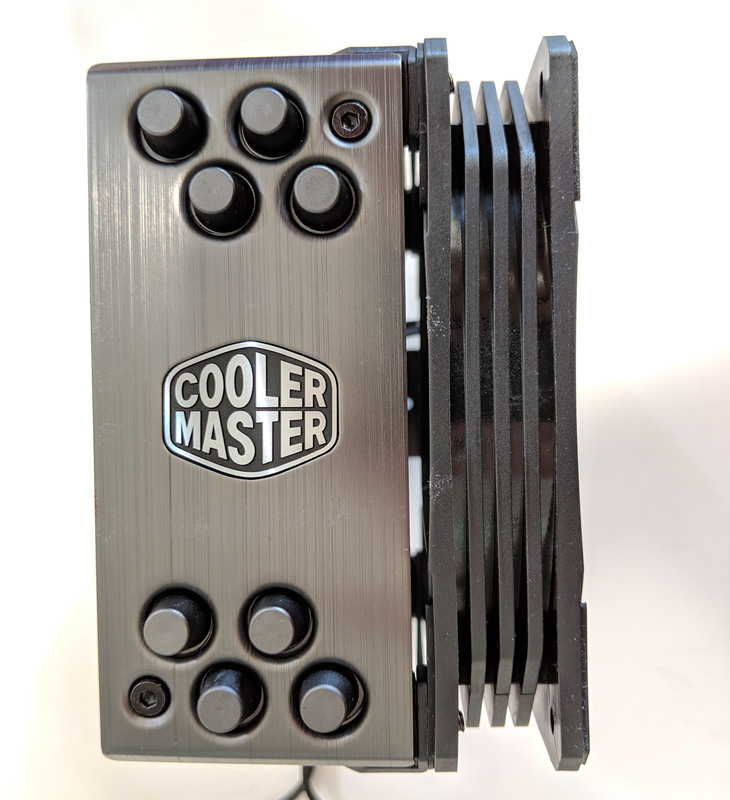 Overall, it’s REALLY difficult for me to find anything negative to say about the new Cooler Master Hyper 212 Black Edition coolers.